MLB Pipeline has released its Top 100 prospect list for 2018 and six members of the Phillies' farm system made the cut. The MLB Pipeline Top 100 list is released at the beginning of every year and is updated throughout the season. Only players yet to exhaust their rookie status players and those under the age of 25 after playing professionally in a different country are eligible for the Top 100. The list is constructed by prospect experts Jonathan Mayo, Jim Callis and Mike Rosenbaum, who evaluate the players based on past performance, skillset, upside, potential impact on their big league club and the opinions of scouts and scouting directors. The Phillies' top prospect according to the ranking and No. 26 overall is 19-year-old Sixto Sanchez. A native of the Dominican Republic, Sanchez dominated the South Atlantic League with a triple digit fastball and excellent command. Prior to earning a promotion to High-A Clearwater, Sanchez went 5-3 with a 2.41 ERA for the Lakewood Blueclaws. Ranked the 10th best RHP pitcher according to Pipeline, Sanchez is expected to open up the season in Clearwater where he finished 2017 going 0-4 as one of the youngest pitchers in the Florida State League. Scott Kingery finds himself as the 35th overall prospect and best second base prospect in all of baseball according to the Pipeline. 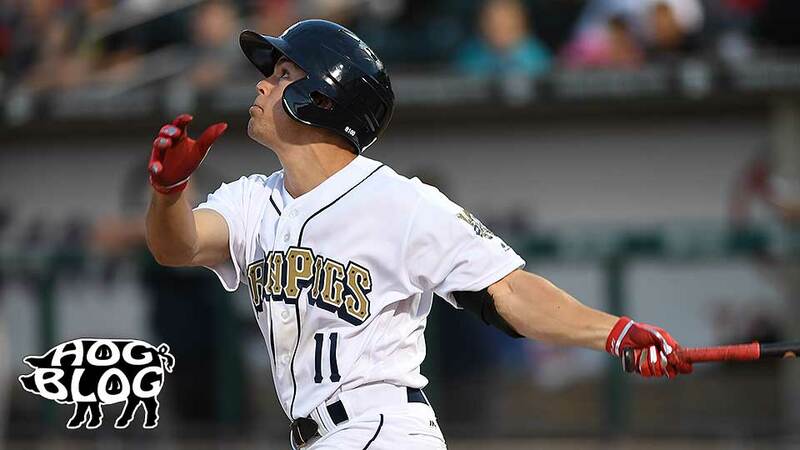 Left off the preseason Top 100 last season, Kingery is expected to be back in an IronPigs uniform to begin the 2018 spring. The former walk on and second-round pick out of Arizona played in 63 games for Lehigh Valley during the 2017 season, batted .294 with 22 extra base hits and set an IronPigs record for the longest hit streak in franchise history (23 games). No stranger to the Top 100 list, J.P. Crawford is ranked as the 37th overall prospect and the No. 7 shortstop. Although Crawford was called up at the end of last season he is still considered a rookie but will lose his status by the end of April and will graduate from the list. Crawford, who is likely to be the Phillies' Opening Day shortstop, batted .214 in 23 games for Philadelphia in 2017. A sure-handed defender, Crawford was also ranked as the top defensive shortstop on the MLB Pipeline All-Defense team. Adonis Medina is the 86th overall prospect and another bright young arm in the Phillies' system. The 21-year-old made 22 starts for Lakewood last season and struck out 133 hitters in 119.2 innings. Opponents hit .227 against the Dominican Republic native who has a mid-90s fastball and secondary pitches which should prove to be handy as he climbs the minor league ladder. The 2016 No. 1 overall pick, Mickey Moniak struggled in his first full season of pro ball in the South Atlantic League but at just 19-years-old the California native still has a tremendous upside. Moniak will likely be back in Lakewood for the 2018 season and with a year under his belt all signs are looking up for Moniak as he bounces back and shows why he was the top pick just two seasons ago. The final Phillies farm hand on the Top 100 list is 21-year-old Adam Haseley. The seventh overall pick in the 2017 draft and former Virginia Cavalier advanced three levels in his short time with the Phillies. Haseley can play all three outfield positions and hit .284 with a .761 OPS could open the season back in Lakewood or with Clearwater if he has a successful spring.